Get into the circus spirit! 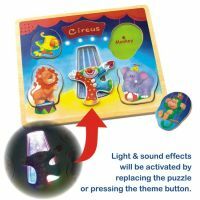 With four brightly-colored puzzle pieces to replace, this toddler puzzle will help increase hand-eye coordination and shape-matching, and with the bright lights and circus sounds, it'll also keep them entertained for hours! Correctly matching puzzle pieces triggers the fun and exciting reward. Put the pieces in correctly or press the big clown button to activate the sound and lights!